This charming National Trust Timber Shed is the ideal addition to a traditional country garden, or for those wanting to inject some characterful class into their outdoor space. Selected from our National Trust collection of Sheds and Summerhouses, the building was designed and built at our Norfolk factory before being both delivered and installed at the customer's address by our in-house team of installation experts. Designed and hand-built to order at our Norfolk factory, this FSC® certified Scandinavian Redwood timber Greenhouse is the ideal addition to any proud gardener's outdoor space and boasts a traditional, Victorian design. As with all of our stunning timber buildings, the Greenhouse was both delivered and assembled at the customer's specified delivery address by our expert installations team. 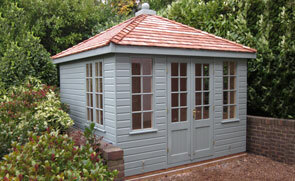 A customer recently selected this stunning Wiveton Summerhouse from our range of FSC® certified Scandinavian Redwood timber buildings to be a year-round retreat at the bottom of the garden, allowing them to escape the confines of the household and embrace the great outdoors no matter what the weather is doing. 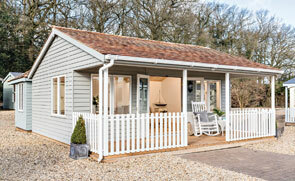 Chosen from our range of quality Summerhouses, the Wiveton was designed and hand-built to order at our Norfolk factory before being both delivered and installed at the customer's specified delivery address by our in-house team of installation experts. 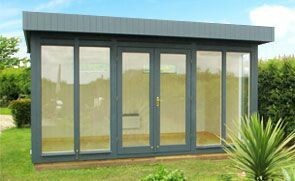 This stylish and contemporary FSC® certified Scandinavian Redwood timber, quality Garden Studio was recently installed for a customer needing a convenient and high-quality garden studio that merged perfectly with their outdoor space. 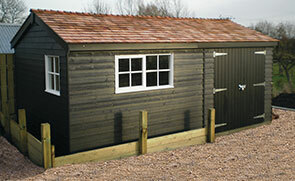 Measuring 8 x 12ft, the building was selected by the customer from our vast range of Garden Studios.